The mushroom is composed of an underground part (mycelium) and an aboveground, often edible part that is also the reproductive organ. Microscopic seeds acting as reproductive agents; they are usually released into the air and fall on a substrate to produce a new mushroom. Axis supporting the mushroom’s cap. 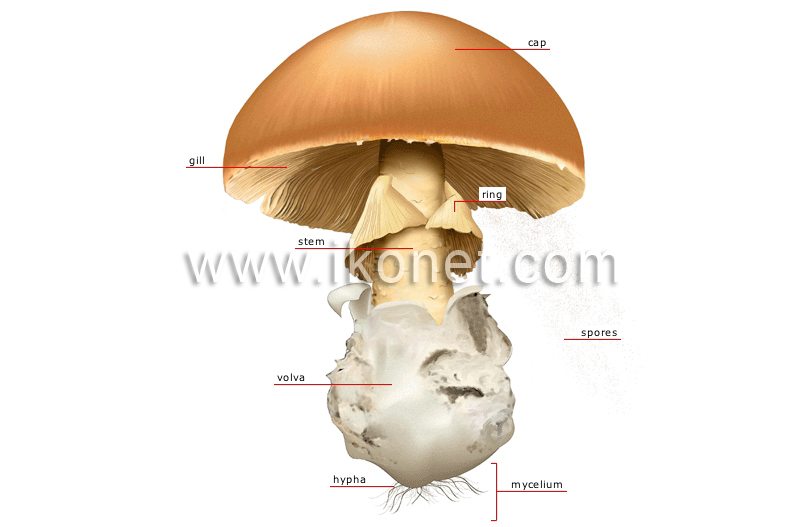 Fertile spore-producing part of the mushroom, located under the cap. Tangle of hyphae created through spore germination, from which the aboveground part of the mushroom develops. Microscopic filament, often white, that draws water and the organic matter necessary for mushroom development. Remnant of a membrane that completely covered the immature mushroom and ruptured as the stem grew. Membrane located under the cap and circling the stem; remnant of a membrane that covered the gills of the immature mushroom and ruptured as the cap grew. Differently shaped and colored upper part of the mushroom that protects the gills; it usually resembles a headdress, hence its name.